All local and global change-makers, ICE Days is BACK! 5 Days! 5 Topics! 10 Speakers! scene in Hong Kong and Asia! 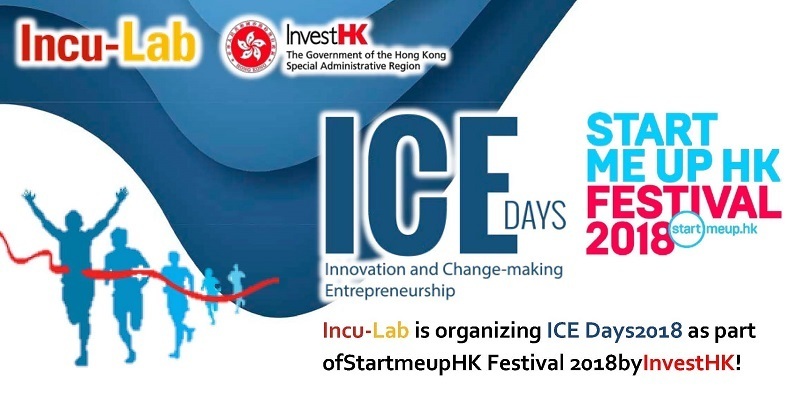 As a part of StartmeupHK Festival 2018 (29 Jan – 2 Feb) organised annually by InvestHK, ICE Days is a 5-day idea sharing marathon in which change-making entrepreneurs and insiders will be sharing their insights and experience in different topics related to innovation and entrepreneurship. ICE stands for ‘Innovation for Change-making Entrepreneurs’. Incu-Lab ICE Days is an idea and experience sharing marathon about innovation and entrepreneurship, to let local and global change-makers to understand more about the rapid development of the startup scene in HK and Asia. It is 5h time since ICE Days is organized by Incu-Lab. Last year, ICE Days 2017involved 21 distinguished speakers sharing insights and ideas on topics such as startup entrepreneurship, social innovation and smart city, attracting more than 200 people attended in total.